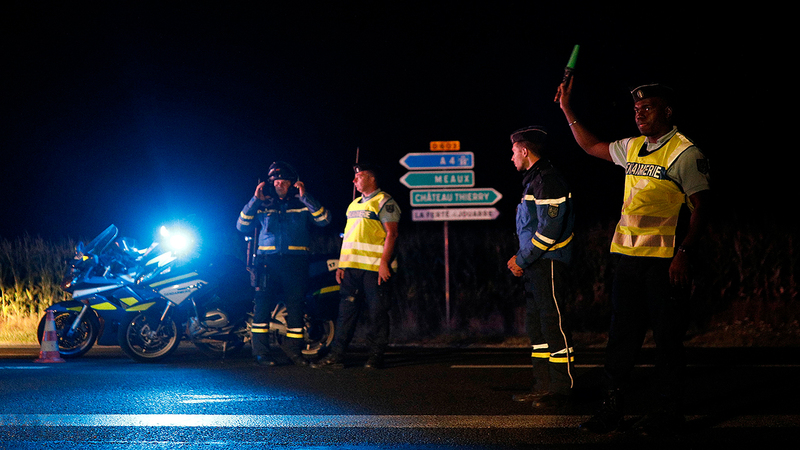 PARIS -- A man believed to be under the influence of drugs - and possibly suicidal - deliberately rammed his car into a pizzeria east of Paris on Monday night, killing an adolescent girl and injuring her younger brother and 12 others, authorities said. The driver was immediately arrested in what was the latest of several attacks in France and elsewhere using a vehicle as a weapon. The local prosecutor said the man's actions in the dinnertime attack in the town of Sept-Sorts were clearly deliberate, but not terrorism-related. The girl and her brother were among restaurant patrons eating on the outdoor terrace of Pizzeria Cesena when a man in a BMW accelerated toward them, an official with the national gendarme service told The Associated Press. Some officials said the girl was 13, while the prosecutor said she was 12. The girl died immediately, and her brother's injuries were considered life-threatening, according to a gendarme official, who was not authorized to be quoted by name. Deputy regional prosecutor Eric de Valroger said a 3-year-old boy was flown by helicopter to France's premier children's hospital in Paris and 12 other people were also hospitalized, four in serious condition. Speaking to reporters near the attack site, de Valroger said he had opened a homicide investigation. At this stage, he said, "I rule out a terrorist motive." He called it "highly probable" that the driver was under the influence of drugs and that he left the road and deliberately aimed his car at restaurant-goers. De Valroger identified the attacker as a 31-year-old from the nearby town of La Ferte-sous-Jouarre. The suspect is believed to have tried to kill himself last week, French Interior Ministry Pierre-Henry Brandet said on BFM television. Brandet said the man was not known to intelligence or police. Explosives experts combed the area and found no weapon other than the car itself, according to the prosecutor. Witnesses to the incident were being given emergency counseling. A police official said authorities were not searching for accomplices, and a security official said there was no evidence of a political or Islamic extremist motive. The targeted pizzeria is in a shopping zone in the small town of Sept-Sorts, about 65 kilometers (40 miles) east of Paris near Champagne country. Police cordoned off a large area, and BFM reported that a nearby Chinese restaurant was requisitioned to take in victims and survivors. The incident on a quiet August night on the eve of a national holiday reignited fears after multiple attacks in which a vehicle was the weapon of choice. An Algerian man with unclear motives drove his car into a group of French soldiers last week, and an Islamic extremist truck attack in the French city of Nice left 86 people dead a little more than a year ago. French President Emmanuel Macron and his government expressed condolences and support for the victims and survivors of Monday's attack, according to an Interior Ministry statement.